A HUNT master and a member of his staff have been found guilty of illegally hunting fox cubs with hounds. The Honourable Johnny Greenall, son of the Baron of Daresbury, and Glen Morris, of Ludgate Street, Tutbury, were secretly filmed by anti-hunt protesters trying to kill foxes near Hilton. Greenall, 52, was fined £3,515 and Morris, 43, currently off work while suffering from depression, was ordered to pay £515. 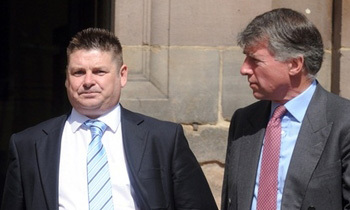 Both men denied breaching the Hunting Act but were both convicted yesterday. Greenall paid the fine in full before leaving court. Footage played at South Derbyshire Magistrates’ Court showed members of the Meynell and South Staffordshire Hunt surrounding a wood at Suffield Farm in Sutton on the Hill in October last year. The hounds entered the wood to hunt young foxes in a sport known as ‘cubbing’. One fleeing fox was scared back into the wood by the surrounding huntsmen who were clapping their hands. Bertie Woodcock QC, defending, said that the footage did not show Greenall was clearly involved. But Sarah Lloyd, prosecuting, said Roger Swain, one of the protesters who filmed the hunt with a handheld camera, was certain Greenall was chasing one of the foxes. Hunting foxes with dogs was made illegal in the 2004 Hunting Act. But Mr Woodcock made an application to the district judge to throw out the case against the defendants as there was ‘no case to answer’. This was turned down by district judge Caroline Goulborn. The defendants chose not to give evidence in court. Summing up, the judge said: “The evidence that Greenall was the hunt master is not in dispute nor is the fact that he was there that day. “Greenall gave an innocent explanation as to why he was there in his police interview. But he has chosen not to give evidence in front of me. “This is because the evidence would not stand up to any scrutiny.” Speaking outside court, Mr Swain said: “We are very pleased that the case has been successful. It is a relief to know that justice has been done. “The downside to the situation is that the pack of hounds is out there and is trained to kill fox cubs. Tim Bonner, from the Countryside Alliance, was disappointed with the ruling. He said: “I am surprised at the verdict when there is no evidence in which foxes are shown to be pursued, let alone being caught by the hounds.